Enhanced E-bookDigital resources are stored online in your NSTA Library. 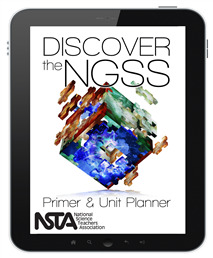 Learn how to use Discover the NGSS: Primer and Unit Planner to conduct school- or districtwide professional development at an all-new train-the-trainer workshop at the NSTA Area Conference in Philadelphia! Discover the NGSS: Primer and Unit Planner is an Enhanced E-book* that offers a comprehensive introduction to the Next Generation Science Standards. All told, the e-book offers up to 40 hours of interactive professional learning and covers background information, each of the three dimensions in depth, and steps to move teachers toward classroom implementation. ​ The book’s first module undertakes an exploration of the three dimensions of the NGSS—the practices, the disciplinary core ideas, and the crosscutting concepts. Utilizing numerous interactive elements, learners analyze classroom videos, answer questions, and develop arguments from evidence while becoming proficient at understanding the structure and significance of the three dimensions. In module three, learners apply the knowledge gleaned from previous segments to plan units of study and learn how to assess whether a given curriculum aligns to the NGSS. Finally, try out the Unit Planner! Grade-specific dropdown menus guide you step-by-step through the process of organizing and developing an NGSS unit of study. Whether a quick refresher or a deeper dive into the standards is required, Discover the NGSS provides an organizational structure and a richness of interactivity from which all learners can benefit. It is also a very handy reference! With the Discover the NGSS enhanced e-book, users can work independently or with groups to gain a deeper understanding of the NGSS. This book is absolutely amazing! The goal of this book is for you as a teacher to understand the NGSS and it succeeds in doing this. The e-book is exceptional. Not only does it have content that anticipates your questions and needs. The e-book is also full of videoes to see models of instructional material. As well as interactive labs that you can participate in to help your learning. This book is full of tools that can be used. It is can be read on almost any device so you can take it with you where ever you go. I recommend this book to anyone who wants to establish a firm foundation in their understanding of the NGSS. Wow, great book of information and unit planner. I will share this with my grade level. I found this enhanced ebook very helpful. The information was easy to understand and useful. The interactive questions to test your knowledge an comprehension was very helpful. I really like the section that guides you in planning a lesson. I enjoyed having information about the NGSS as well as a place to really personalize my continued learning. It was easy to navigate and the visuals are amazing. Discover the NGSS helped me to not only have a greater understanding of the standards, but also the shift in practices. I plan to use it to train other teachers on the Next Generation Science Standards. The interactive format makes it easy to plan an engaging session. As my school district makes the switch to adopt the NGSS this book has helped me gain a better understanding of these standards. It has also helped me understand more about what needs to happen within my own classroom to get my students further in their understanding and abilities. It has also helped me lead the charge in the school district in the adaption process. The multimedia approach (use of simulations, videos, etc.) was fantastic! I have used many resources from this enhanced e-Book in my professional development work with science teachers in our school district. I would highly recommend! Discover NGSS is awesome! I finally got time to sit and spend some time with my Discover NGSS and I was not disappointed. I love all the components especially the Unit Planner. I work with K-5 classroom teachers and I cannot wait to share this resource. This new enhanced ebooks has entry points for all levels of #ngss learners and none of us are experts all the time. Having said that, I do have a place where I can go and find what I need whether it is the very basic “NGSS, what’s that?” to “Need to double-check I understand coherence” to the user who is going to jump right to the Unit Planner to begin work. Being able to access Discover NGSS is another reason, I love it. I don’t have to carry my work laptop back and forth every day because I can access it at home too, just by signing into the Learning Center and going to my library. I also use it on my IPAD almost every day. I love it because I can move back and forth between Discover NGSS and my supplementary documents, pictures, and videos that I might want to include in my Unit Plan. Discover NGSS also means I do not have to carry around my Framework for K-12 Education Standards or the two volumes of Next Generation Science Standards because I can carry around my IPAD and have it all right there and accessible anywhere! The best part of this enhanced e-book is the unit planner. However, I can't figure out how to actually save it anywhere so I can go back and work on it again! This is very frustrating, because I want to start it, and then go back to add more as I have time. When I share the unit with myself via email, there is nothing at all in the body of the email, and nothing as an attachment. Please help! [From my review on Goodreads at http://www.goodreads.com/book/show/44243120-discover-the-ngss ] Do yourself a favor. Instead of spending a large amount of money on "Discover the NGSS: Primer and Unit Planner" e-book, buy yourself a book about science that you might enjoy. You deserve it. Pay it forward. Enjoy the wonders of science! !